Remember that we previously reported the latest low-end discrete GPU offerings from AMD will be re-brands? Well, it looks like the low-end desktop offerings will get the same treatment. In a series of documents detailing the next low-end discrete GPU offerings from AMD, all of them indicate that AMD will not make a low-end part based on the Graphics Core Next (GCN) architecture, but instead they are all re-brands of the legacy VLIW5 products, and are targeted, at the time of publication, to OEMs only. The offerings span four families, with model numbers ranging from 7300 to 7600. In short, HD 7350 will be Cedar, HD 7450 will be Caicos, HD 7570 will be Turks Pro and HD 7670 will be Turks XT. All of these GPUs will be made on TSMC 40 nm process, no surprises there. For the sake of brevity and readability, we are not going post the specifications for yet again, as they are literally the same. “Why rebrands instead of a new ASIC?” This would probably be the first question that pops up after reading the last paragraph. If we look at the overall desktop APU and GPU strategies, it looks like AMD is trying to solve the manufacturing and financial issues in one shot. We first take a look at the manufacturing side. When we look back in the timeline, AMD used TSMC 40 nm process to make Bobcat-based APUs (codenamed Ontario, Zacate and Desna) and the Radeon HD 6000 series discrete GPUs. Back during the Radeon HD 5000 times, there weren’t severe shortages besides some earlier hiccups due to TSMC’s inability to fix their process. When AMD started making Bobcat-based APUs along with their discrete GPUs, the conflict become more and more obvious: the two vastly different products are fighting for wafer starts. And then, there comes the catalyst, demand for both products are high, as Bobcat-based APUs raised the bar for power efficiency with adequate performance while the Radeon HD 6000 GPUs provided an attractive feature set and performance over the competition at a lower cost. AMD was in a dilemma, either they sacrifice GPUs (including the high-end offerings) for the APUs, or the other way round, sacrificing the APUs for the GPUs. However, none of which is more beneficial to AMD over another, AMD hurts either way. While the APUs have delivered their promises with Llano providing mainstream-class graphics performance which renders the low-end discrete GPUs obsolete. AMD looks to be refreshing their legacy products on an older process for OEMs only, and promoting APU platforms to end-users while shifting the focus away from the low-end discrete GPU market. This would seem to be the only viable solution to solve this issue on the manufacturing side, especially when moving to a newer and smaller fabrication process. While TSMC’s ability to execute on 28 nm is still remains to be seen, the uncertainty this creates pushes AMD into this shift. This, of course, does not take into account TSMC’s wafer price increase for 28 nm wafers. Continued reading of AMD’s documents, the targeted audiences are the “lifestyle PC” people and the light-gamers, who don’t require the bleeding-edge technologies in compute and graphics rendering, but instead require low power consumption while having adequate graphics performance. While current low-end offerings already provide enough or more than enough graphics horsepower the market may be enticed by these offerings despite the re-brand. Therefore AMD gets faster time-to-market (basically zero for re-brands) rather than taking up the expense, time, and the driver/software optimization trouble. AMD doesn’t have to change the configurations of the building blocks of the GCN architecture to cater for the low-end market, while saving R&D resources for the other GCN-based GPUs, or even for “C.I.”. Maybe Nvidia has been onto something all these years with re-brands and AMD was slow on the uptake. You may say, the ASP and margins for these re-branded GPUs will be in the toilet. 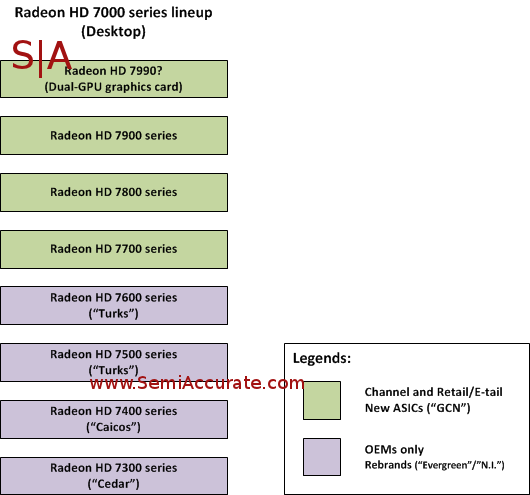 Let’s take a look at the big picture, if we see the whole Radeon HD 7000 series lineup, the real solution lies in the GCN architecture. The efficiency of GCN-based GPUs are improved greatly, and AMD will naturally want to sell them for a higher price because of the large performance increase over the last generation. With these re-brands targeting only OEMs but not retail, the volume drops a considerable amount, considering Apple also dumped them in the latest MacBooks. So the effects of these chips to the overall margin level of the GPU department will be lower, with GCN-based chips moving up the pricing structure, this effect would probably be canceled out, and the quarterly results will, again, be pretty for the GPU department. One may also discuss, as we here at SemiAccurate do, the volume and marketshare issues, with the lowered volume for re-branded chips and the new chips having TSMC-related issues, the total volume shipment for AMD GPUs will surely drop downwards. Will this affect AMD’s competitiveness in getting marketshare while NVIDIA is going to introduce a lot more GPUs “soon”? We are seeing a shift in targets here, the low-end discrete GPUs are less and less relevant with the introduction of APUs from AMD and similar products from Intel. Would AMD rather have their APUs fight for marketshare, especially for small and thin devices like HTPCs and ultrathin laptops, or would they rather have their low-end GPUs hold that spot?